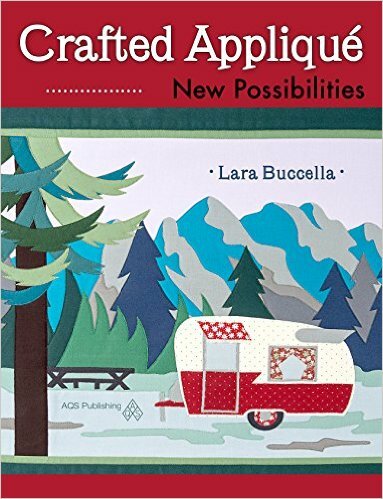 A faithful and super talented reader of my blog, Lara Buccella, contacted me recently to ask if I would like to review her new book Crafted Applique. Lara has been super dear to me, so I might have said yes just because of that…but it turns out that her book is about a process that I am very passionate about: Raw Edge Applique. So I knew that I needed to see it. Lara has a great new spin on the process for creating the applique pieces that you’ll just have to get the book to check out. (A little mystery is a good thing right?!) But I have tested out the process myself and I am here to tell that it does indeed work quite well. I am happy to have a new technique in my arsenal. Her book, along with describing her technique, has a few patterns available as well. And I immediately fell in love with one titled Cecropia Utopia: a moth. Lara makes hers very true to nature in color choice, but I used a little poetic license and stepped outside the box. I chose a warm palette of browns, yellows and cream, with a pop of pink. My main fabric is a fabulous Anna Maria Horner fabric from her recent line Fibs and Fables. 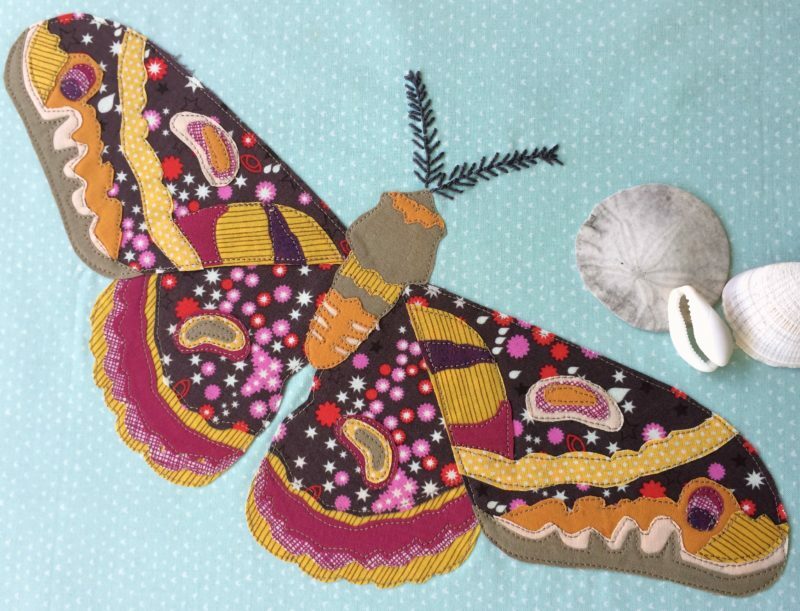 Because I used such a busy fabric for the background, I ended up leaving out some of Lara’s tiny details to the moth, preferring instead to let the fabric do some of the work for me. 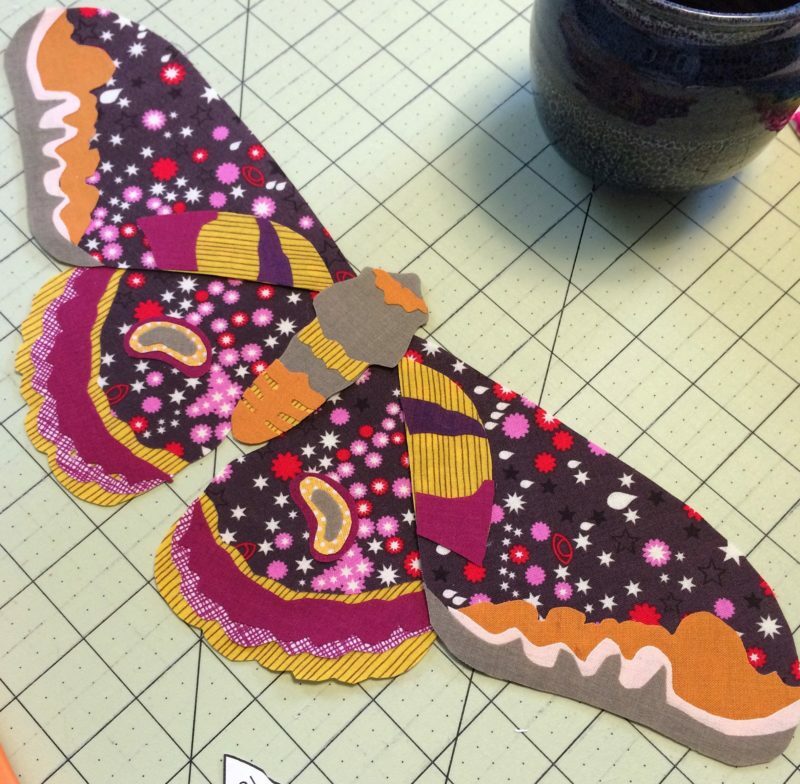 I worked hard cutting out each piece and its mirror image for the moth. As you can see, the pieces are fairly intricate. This is definitely not a project that can be done with needle turn applique. Raw edge applique is required. And Lara’s technique keeps the edges perfectly crisp through the process. There was absolutely no fraying on the fabrics. And then the stitching…. it’s a bit of work to do the required detailed stitching on a piece like this. I never tackle the easy things. lol I’m showing you a quite detailed shot of my stitching here, so be kind. My biggest tip: Use an open toe applique foot. Absolutely necessary in my opinion. I also really love using a rayon thread for the top when doing applique work like this; the sheen is lovely. I chose to use a single neutral color for the entire project, but I’ve also done projects where I’ve switched out the color for each different fabric. I wanted to see my stitching, so I didn’t try to blend it in. The last portion I did was the antennae. And they are quite pronounced in the pattern. So I chose to hand embroider these with a pearl cotton thread. 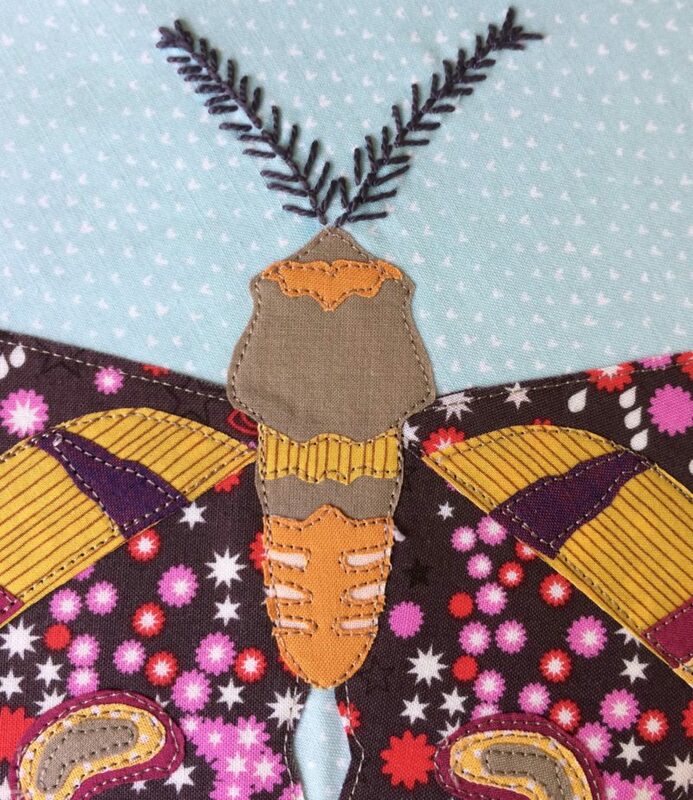 I kind of love the contrast between the stitching on the moth and the bulkier stitching of the antennae. It creates more interest in the piece. I think the pattern is pretty spectacular. And I adore how my fabric choices worked. At some point I stopped following the pattern and just went with my instincts on color and fabric placement. I like that this pattern lets you have that freedom. To find out more about Lara’s book and other reviews and projects and giveaways, check out the calendar below. Introduce Tour Valerie Smith Pumpkin Patch Quilter Dana Gaffney Stormy Days Lorna McMahon Sew Fresh Quilts Mary S.
Thank everyone! Announce my own Giveaway Winners! I LOVE your butterfly! I would love to learn how to do applique. This book looks awesome! I have the book Angela, but had to compliment your work, this is stunning! The butterfly is gorgeous! So interested in this book. Lara is a sweetie. I follow her blog. Your butterfly is spectacular. I love your moth! It’s gorgeous! Wow, your butterfly is beautiful. Your butterfly turned out spectacular…unique color choices that work so well. Thanks for sharing! There are some very interesting projects in this book. Love your butterfly! Your moth is beautiful. Great job on the stitching! Oh I definitely let out a Whoop! and a Wahoo! when I saw your post Angela! This is my favorite project in the book and I love your moth even more than I love mine! You know I’m going to have to make one as fun as this now! I especially love your fabric choices. They do actually accomplish some of your work for you – always a plus. You are super dear to me too and your opinion means so much to me Angela! I’m just so happy that you like my Crafted Applique technique! I’m really looking forward to seeing what you are working on in your own applique adventures! Wow! Such detail. Thanks for your hard work. I think your moth turned out great. There were a lot of direction changes to stitch! You did justice to a lovely design. I’m excited to learn the trick to Lara’s technique for applique. I love how you let the fabric do the talking- great fussy cutting. Very Clever! Great job! I love the detail of your moth, and especially those big wonderful antennae to contrast the delicate nature of the rest of the work. Did this make a pillow-size applique? I’d love to make one for my daughter’s new apartment. Love your Cecropia Utopia! Can’t wait to try out the Crafted Applique method. I am amazed at the close-up details showing the stitching and clean lines of the applique. What a beautiful project and so well done! Very nice. I will remember Rayon thread for my next applique attempts. Your moth is truly amazing. I am not a huge applique fan, but this book makes me want to give it another try. I did a little applique baby quilt last week and sent it off…simple little whale but cute. I am also doing the Splendid Sampler and there are a lot of applique blocks.I am going to have to give this book a look. Wow your moth is absolutely gorgeous and your photos are so clear! 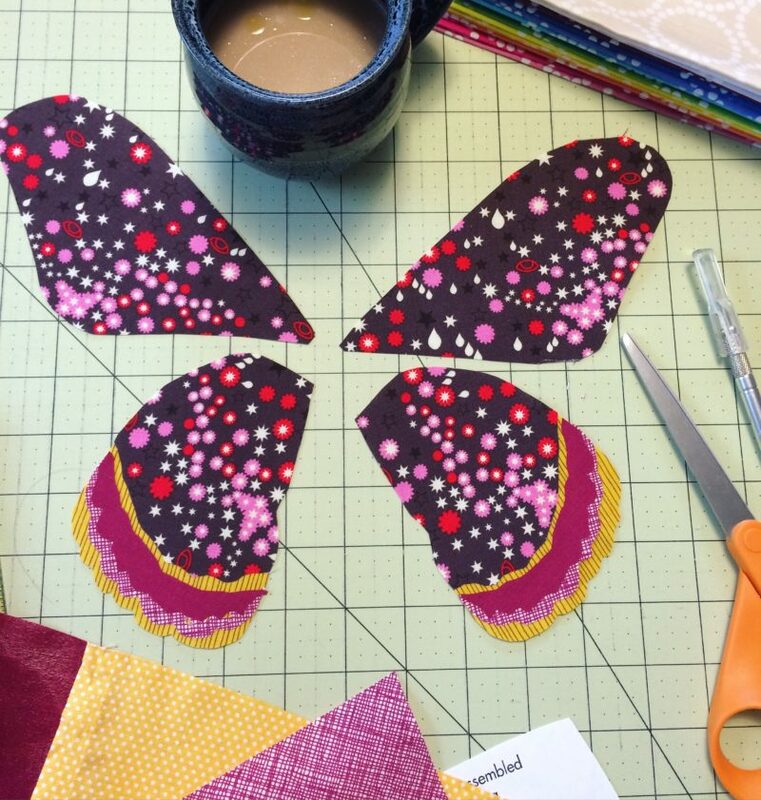 Thanks for sharing your project – really spectacular fabric choices! This book is going on my must have list! Wow, what amazing applique! Whatever magic this book teaches, I need to learn! It’s all in the details, great project! Thanks for the detailed photos. I am very intrigued by Lara’s applique method and I look forward to the book. Beautiful work-so well photographed. The book has me intrigued! Pretty moth. Great close up shots. This is absolutely stunning Angela! I love everything about it – fabric choices and shapes, the stitching! What is final product going to be? Will you make a pillow? nice new site btw! My first visit to http://www.angelapingel.com friend! Wow! That looks like a lot of layers, and you did a beautiful job! Your moth is spectacular. It’s so fun to see it in other colors. I want to do each one of her great projects in the book. Your moth is absolutely stunning! Great fabric choices! It looks great. I love the stitches showing on top of the fabric. I think I need this book! Love all the projects I have seen using this technique. Love your moth. In fact I have loved all the projects that I have seen, so far. It looks like a good book to have and use. 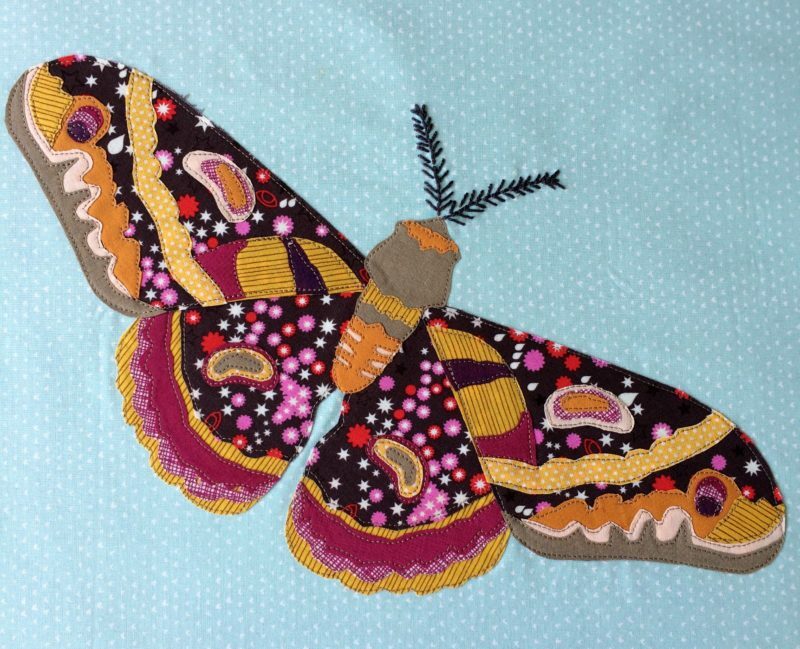 I love your fanciful version of the moth and the way you used the fabric design for the details. This technique looks amazing with the amount of detail you can get. Your butterfly is pretty and sure looks easy! I can’t wait to get my hands on this book. nice butterfly. This technique looks quite intriguing. Your moth is so beautiful! I’m anxious to learn this way of applique. I’m excited about a method used to to keep the edges so clean. Looks like a great technique. I’d love to give it a try. Thanks so much for sharing. Your moth is stunning. This book looks so great! Great butterfly. I want that book. 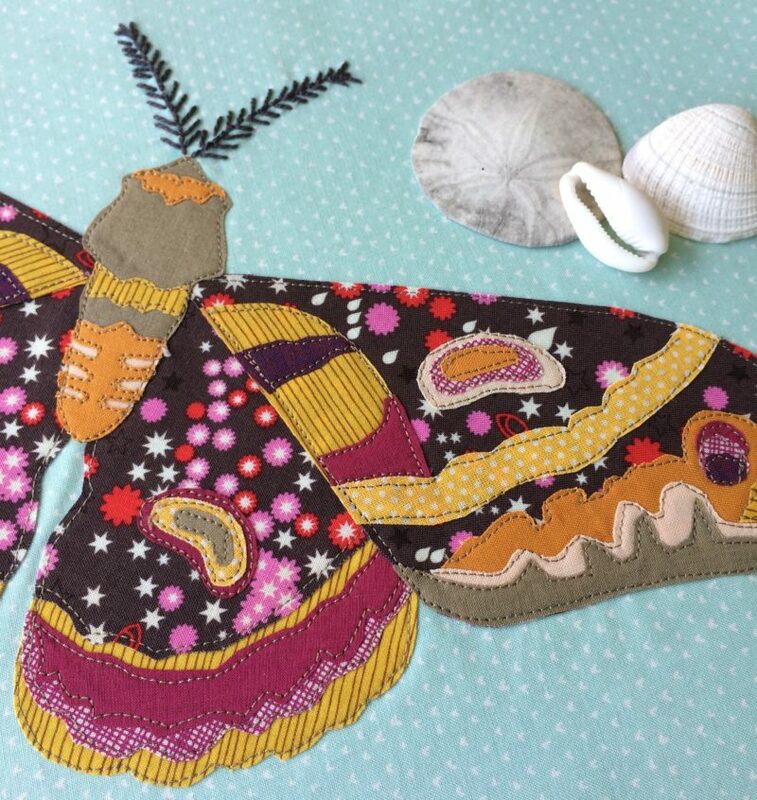 I love Lara’s moth, but your fabric choices made yours absolutely spectacular! Isn’t Lara clever with her applique method?! Your moth is quite simply stunning. Your moth is so beautiful that I will call it a butterfly; it is absolutely stunning! Beautiful moth. Your fabric choices are wonderful and the applique looks so nice. I agree with you wholeheartedly! What a beautiful butterfly! Oh that is so wonderful!!! I love how your moth came out. Your moth is awesome. the color placement is outstanding. 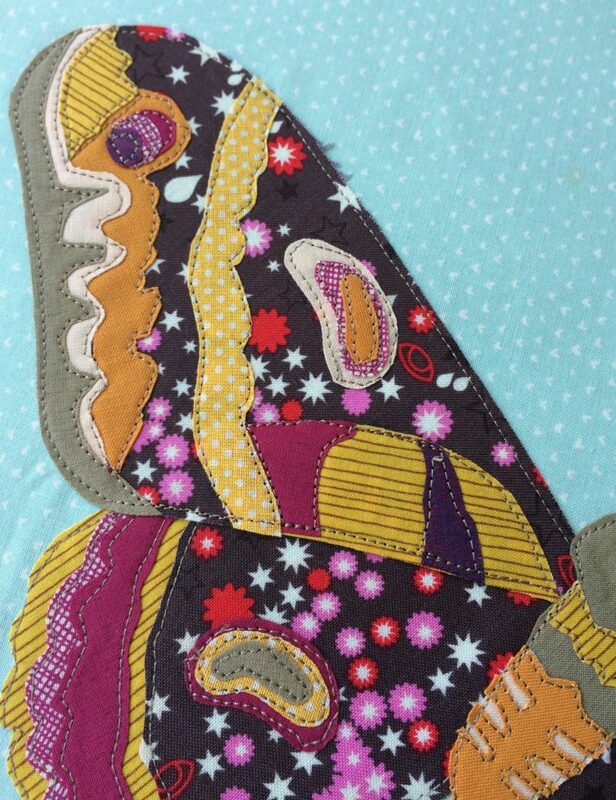 Lara’s applique method is most intriguing and I am anxious to try it. Everyone sounds so excited about it.